Strictly speaking, the uninterrupted history of The Essex and Kent Scottish Regiment began in 1885. Its roots, however, reach back to the area's earliest European settlement. Before the mid-nineteenth century, the isolated southwest peninsula of Upper Canada was separated from the rest of the colony by a vast expanse of unsettled wilderness. With hostile Americans on the other side of the Detroit River, and French settlements dotting the other side, the British government in the early nineteenth century was uncertain that it could retain this remote frontier. The law required all male British subjects to bear arms as militiamen. However, neither the colonial administration nor the British army bore the responsibility of training, outfitting, arming, or paying these men. The militia's role, therefore, was limited to conducting "an annual parade on the birthday of the reigning monarch." 1 Its members would assemble on this date with whatever weapons they happened to own: muskets, shotguns, fowling pieces, or pitchforks. Nevertheless, its regulars provided invaluable support to the defense of the Detroit frontier. During the War of 1812, for example, the militia units of Essex and Kent counties made up a significant portion of participants during the fighting at Detroit, Frenchtown, and Fort Meigs. As the war dragged on, however, the British government shifted its strategic priorities, leaving the militiamen without means to sustain the struggle along the border. Local units sustained ten percent losses through casualties and disease, while the American occupation left the prosperous counties of the southwestern peninsula desolate. The Western District had not yet recovered from the first invasion when an American army under the influence of William Lyon Mackenzie attacked again in 1838. Believing that an invasion would spark a general rebellion, Mackenzie hoped to liberate the colony from the despotism of the Family Compact: "Will ye rally round the standard of our tyrants?" he asked the Essex and Kent militiamen. 2 Nevertheless, the dissatisfied populace did not embrace the ideals of their southern neighbours, and instead remained loyal to the Crown. Essex and Kent militias were left to repel two attacks on their own, and then fought alongside the regular British army in two more engagements. This time, the invaders did not breach the boundaries of Windsor. The Patriot War of 1838 marked the last time Essex and Kent counties were invaded. Despite having been ill-prepared, the local militias had borne the lion's share of defending the frontier, in the process affirming their preference for British institutions over American ones, which the Sandwich Western Herald had dubbed "mobocracy." The unrest, however, resulted in the introduction of responsible self-government to the colony and the creation of the Province of Canada. Things were relatively quiet until the end of the century. Between the creation of the Province of Canada in 1840 and Confederation in 1867, acts were passed to establish a regular militia, provide monthly drill training, and introduce training courses for officers. Although Colonel Arthur Rankin organized the independent companies in Essex County into the 23rd Battalion of Essex Infantry in response to the Fenian assault on New Brunswick in the spring of 1866, no trouble came to the Western District, and the unit disbanded in 1882. It wasn't until Louis Riel's 1885 Northwest Rebellion that Windsor would regain a militia unit. On 12 June 1885, the Dominion government gave Major John Richardson Wilkinson of Leamington permission to raise five infantry companies of infantry in Essex County to be known as the 21st Essex Battalion of Infantry. It is from this date that the unbroken service of The Essex and Kent Scottish Regiment - which went through a number of name changes before settling on the Essex Scottish Regiment in 1927 - began. The unit was known as the 21st Regiment Essex Fusiliers when the First World War broke out. The 18th Battalion, which was to form part of the 4th Brigade with two other Ontario battalions, was raised in London, Ontario, and drawn from the Western Ontario Militia District. One hundred fifty men from the Essex Fusiliers and 75 men from the 24th Kent Regiment from Chatham joined its ranks. The unit was filled by 14 November 1914, and the men departed for London, England, on 15 April 1915. As the war proved to be a bloodbath of a magnitude no one had anticipated, enlistment dwindled. In May 1916, the idea of raising a Highland battalion, outfitted in the kilt and accompanied by a pipe band, for home service surfaced (recruiters believed that the appeal of Highland dress could help stimulate the pace of enlistment). Captain Walter Leishman McGregor, who had been active with the 21st Regiment Essex Fusiliers since 1898, was to be the commanding officer. Although a Highland unit would cost more to outfit and despite the fact that the kilt was not suited for trench warfare, local leaders "felt that the kilt would be a big draw, pulling in men from far and wide and cutting down on desertions," which would allow the new regiment to reach full capacity. 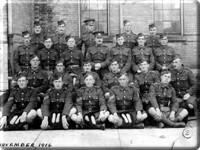 3 Within two months a training and housing facility was established at the corner of Dougall Avenue and Tecumseh Road, and the councils of Windsor and Walkerville had given the unit $10.000 and $3,000, respectively, to purchase kilts. Newly-promoted Lieutenant-Colonel McGregor announced that the regiment was accepting recruits at the end of July. However, the kilts and the pipe band, led by veteran Pipe Major Jock Copland, failed to attract as many volunteers to the 241st Battalion, Canadian Scottish Borderers, as its leaders had hoped. Despite the unit's strenuous recruitment efforts, it went to Halifax on 24 April 1917 with 552 men, 148 below its target goal. Since it was not at battalion strength, the 241st did not go into action as a unit, and was instead broken up to reinforce reserve battalions upon arrival in England. By 1917, the men of the 241st were heading to the front lines. 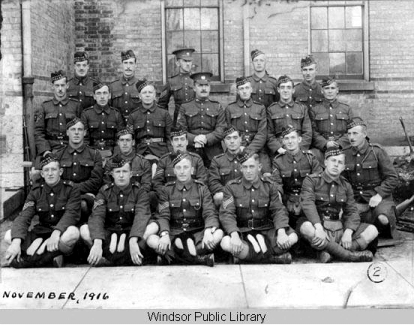 Seventy-four of the 552 men who had departed Windsor with the unit died in battle. Since the men served in a variety of battalions, they did not return home as a group after peacetime, but instead came back to Canada with the units they had been serving when the war ended. Lieutenant-Colonel McGregor nevertheless "made a point of seeing to it that there was a welcoming committee on hand to greet his former men and assist them as they returned to civilian life." 4 The 241st Battalion received one battle honour, The Great War 1917. In 1927, The Essex Fusiliers received word that they were going to be converted into a Highland unit to draw more recruits. Walter McGregor provided the funds for the new uniforms, which would make use of the MacGregor tartan. The Essex Scottish Trustees formed in January 1929 to assist with the perpetuation of the regiment's Highland character and to administer a trust fund for the regiment. Managed by the current commanding officer and several past commanding officers, the Trust remained in operation until it was superseded by the Scottish Borderers Foundation in 1999. One of the most visible features of that Highland character was the Pipe Band of The Essex Scottish Regiment. The band was put under the direction of Pipe Major Jock Copland, a former piper in the Royal Engineers Territorial Force in Great Britain before coming to Canada in 1911. He had founded what became the Pipe Band of The Highland Light Infantry in Galt, where he had lived until being invited to form a pipe band for the 241st Battalion in 1916. After the war, Copland had managed to keep his pipers together as the Border Cities Pipe Band, which, ten years later, evolved into the Pipe Band of The Essex Scottish Regiment. The veteran pipers were quick to earn for the band a widespread reputation, and the local papers wasted no amount of space in their coverage of the band's trips to Miami, Syracuse, and Los Angeles. The new regiment also helped to foster friendly cross-border relations. 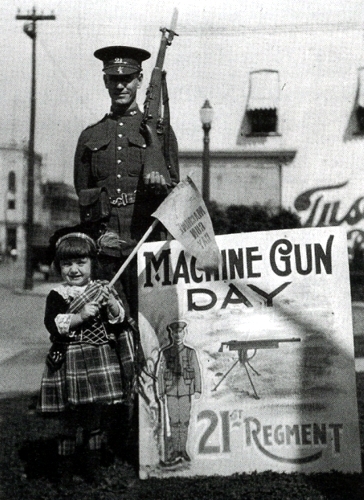 Invited to Detroit by a local American colonel who was also an associate member of the Essex Scottish Officers' Mess, the regiment initiated a new tradition on Victoria Day, 1929: parading down Woodward Avenue to St. Paul's Episcopal Church, where they attended an Empire Day service (this custom continued into the 1970s). 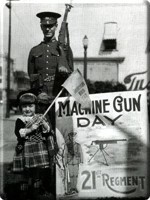 American residents flocked to the parade to watch the kilted Canadian regiment, which was gaining a widespread reputation for its members' marksmanship abilities. But as the 1930s wore on, it became more and more apparent that these light-hearted days of ritual and ceremony were coming to an end.